I really enjoyed my visit to the Museum of the City of New York. My favorite exhibit and the part I spent the most time at was the Future City Lab. 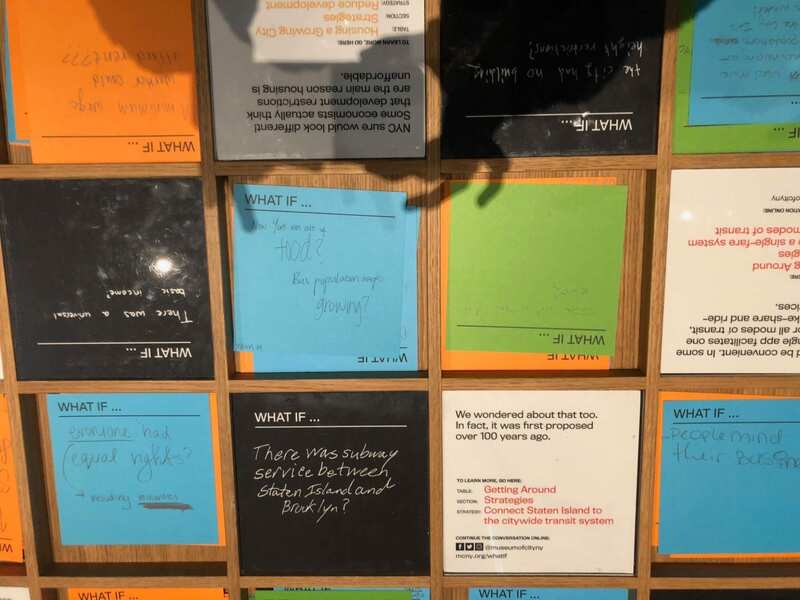 When I walked into the lab, there was a large table with pencils and notecards saying “what if …” People were allowed to write different solutions or ideas that would benefit New York, and on the back people put suggestions or thoughts on how to make that dream happen. Moving on, there was a tv with a film playing, and I spent a lot of my time watching it. It showed different clips of New Yorkers just talking about the city and their lives and what is good and what needs to be improved. It was really interesting to watch and see opinions from people that have lived here longer than me. The best part of Future City Lab was the area where you got to build your own city. There was a collection of touchscreens and you got to choose a community to try and better. When you are done, your new community plays on the screen so others can see your innovations and improvements. I was given options on things to improve things such as environmental impact, mobility, and safety, however every time you made an upgrade to try and better-said categories, the cost always went up. You can have something cheap but elements such as the environment and safety will suffer. You can make everything good and in green but the cost is too much. It’s a cycle that seems to have no solution in sight. This exercise was really helpful to me in understanding the struggles of trying to help the environment without a budget. It is a great way to teach people about the struggles with sustainability that are so common today.